Definition: Involuntary loss of urine associated with urgency (intense need to pass urine). With/without urinary urge incontinence (urine leak before you reach the toilet). Usually with increase day and night frequency. In the absence of urinary infection or other pathology. Neurological conditions: e.g. Parkinson’s, MS, Stroke. Urodynamic study (before the second line treatment). Lifestyle adjustment & Fluid management. Pelvic Floor exercise and bladder re-training. Your posterior tibial nerve runs down your leg to your ankle and contains nerve fibres that start from the same place as nerves that run to your bladder. Stimulating the tibial nerve will affect these other nerves and help control bladder symptoms, such as the urge to pass urine. 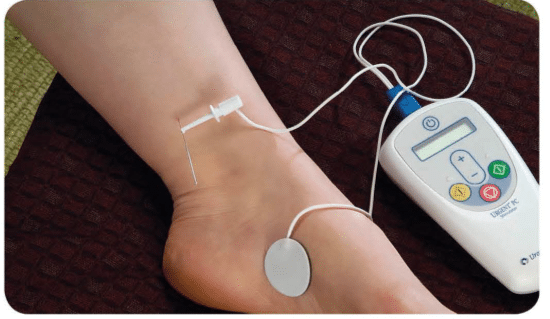 A very thin needle is inserted through the skin of your ankle and a mild electric current is sent through it, causing a tingling feeling and causing your foot to move. PTNS is only recommended in a few cases where urge incontinence has not improved with medication and you don’t want to have botulinum toxin A injections or sacral nerve stimulation. Failed 3 antichilnergic drugs over a year or failed Betmega. Severe side effects of antichilnergic treatment. The effects usually take between three days to three weeks to appear. Repeated injections will be required each time the effects wear off. Difficulty in passing urine in 1 out of 6 patients and sometimes needs for urethral self catheterisation.